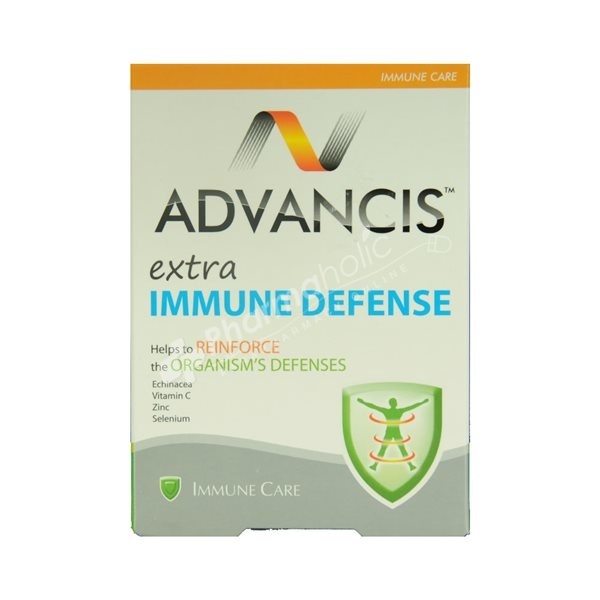 Advancis Extra Immune Defense is a natural dietary supplement, in effervescent tablets which are composed of Echinacea, Vitamin C, Zinc and Selenium. This association is an aid to increase resistance and to reinforce the organism's defences in response to colds and winter-related ailments. 1 tablet a day, dissolved in water, preferably in the morning. Put the tablet in a glass half full of water (150ml) and take it immediately after the effervescence is complete. VCE04 (optimized complex of active ingredients based on: Vitamin C (L-ascorbic acid) and Echinacea purpurea (Standarized extra 4% polyphenols)) 27.62%; Lactose; Polyvinylpyrrolidone; Anti-caking: Sodium bicarbonate; Acidity regulator: Citric acid; Anti-caking: Polyethylene glycol 6000; Zinc gluconate 3,65%; Anti-caking: Sodium carbonate; Flavour; Sweetener: Sodium saccharin, Aspartame; Colour: Riboflavin 5'-phosphate, Sodium selenite (Selenium) <0,01%. Not suitable for infants and young children and during pregnancy and breastfeeding. Do not exceed the recommended dosages. This product must not be used as a substitute of a varied diet.